My mom adopted a new 3 year old male chow, lucky. At first when you see him or talk to him, he will growl. We fed him treats and them he was fine. But since he is a new chow, I don’t want to let me guard down and his harm someone. How do I make him more friendly? Or even working with him, to make him more comfortable with me or my mom? I would suggest patience first of all. It takes time to build trust. Build this with love and kindness and positive experiences. As far as socializing him this is important but he is older with his own 3 years of life experiences so he may never be a social butterfly or he may totally be one with time. I always tell visitors to let my two come to them and sniff and satisfy their curiosity. I don't force anyone on them. No coming at their heads with hands when first greeting. Let him check them out or ignore them if that is his choice. 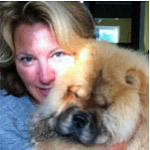 Many chows are aloof and not interested in interacting with others. If he is comfortable you can encourage socializing with treats handed out by your visitors. But if he wants to go lay in another room or at your feet when guests come that is fine. One of mine is very social and one could care less about attention/affection from others. When out for walks or at the park, Petsmart, wherever you need to be very vigilant because people are rude and will have hands on his head before you know it. Most chows are not fond of that direct to the head approach and some don't want people in public petting or touching them. You can go slowly and try to encourage it using treats if it is important to you. Right now your focus is on you and your moms relationship. Build that and then worry about the rest. Give him time and space but also love and encouragement. Let him sleep in your room if he likes, go for walks, see if he is interested in any kind of toys. Talk to him, don't force him into situations. I'm not sure what you know of his background but maybe he's had a rough start and now he is in another strange place with strange people. Thank you, very helpful. Yes at the moment it is just me and my mom trying to socialize with him. I’m just worried because my dad is on vacation, how Lucky will react. Since I find most dogs don’t really like men as much or are scared of him. He was an outdoor dog before hand, so I’m not sure if the owners even pet them. They just purchased to breed and I think they were a little scared of the male. Just be calm and give him some space. Once the realization comes your not a problem trust will take over. I have a large male here that from they day we picked him up as a puppy to his current 10yrs of age has no interest in people petting or groping him. Strangers can go to hell. That said, every once in awhile he picks someone for some reason and they can pet him, hug him, whatever. He has mellowed with age. Several chows have gone through here as fosters as well, some not liking people but in time they build trust. I have this problem as well. I adopted my Sophie from a humane society 6 years ago. She was 2 at the time. Sophie had been surrendered by her family which had 3 chows. One they kept, one they found a new home for, a Sophie was dumped. She was at the humane society for 6 months before I adopted her. No one was interested because of her barking and perceived aggression. One of the workers was able to win her over and they saw that with the right home ershe'd be ok.
Fast forward to now. Sophie is fine with her home and does ok with people she comes to know over time. But she is still quite distrustful and poorly behaved with strangers in public. She has to be sedated to be treated by the vet. She has never been bathed--she will barely tolerate any type of grooming. I love my dog and she listens to me pretty well but I really would like to resolve the grooming issue. The best we've been able to do is to bring combs and brushes with us to the vet, and once she's out, groom like mad till she wakes up. She's quite high strung and I don't want to take her to a groomer and have her restrained and muzzled to be groomed. It would be really stressful and hard on her. We had her boarded last fall for a few days while we went on vacation and they were going to groom her but tested her with the hair dryer first and she went absolutely ballistic, so they didn't do it. Any advice would be MUCH appreciated. Thank you. @JillZ - start grroming with your hands while your sitting around, especially feet and tail. After awhile you can work some real brushes in, patience and persistance. Your going to get push back, work through it. Same with bathing and vet. Our big guy hates the vet. That said he accepts it is necessary as we are with him. He has been known to show is dislike of discomfort bu sliding his front teeth along the vets arms a few times. Just a nice clean shave. Your groomer needs to be replaced, thats not a good environment. Ignore the hair dryer, natural dry for now until the bathing is good. Som edogs equate hairdryer and vaccum as same device. As mentioned, patience and persistance. Our big guy had kids all over him the other day right after someone made a snark comment of dangers of chows. He put up with it for an hour. Ours feel so good after a bath that just mentioning it gets them running downstairs to hop in. One of our dogs was a bit like this. So for a while, every time we had a visitor, we would ask the visitor to give him a treat. Gradually he associates visitors with treats and starts wagging his tail when a visitor walks in. We pity any burglar who tries comng in with our two bears. Hehe.